1. 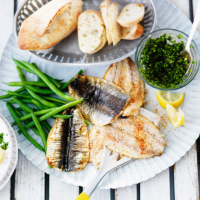 Cook the sardines under a hot grill for 2–3 minutes on each side until lightly browned and cooked through. Sprinkle lightly with the umami dust. 2. Meanwhile, place the parsley and garlic in a food processor and whizz until finely chopped. Add the gherkins, capers and salad onions and whizz again. Stir in the vinegar and olive oil. 3. Divide the sardine fillets between four plates and spoon over the salsa. Serve with the green beans and crusty bread. This recipe was first published in Mon May 11 11:10:46 BST 2015.